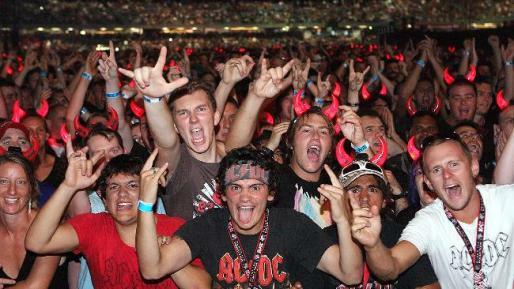 In a real-world version of the chaos and carnage of a Dethklok show, a paralyzed fan at an AC/DC concert found himself in the wrong place at the wrong time. The quadriplegic, a 31-year-old former truck driver, uses a pin to move things around. During a crush at the concert, his friend’s hand accidentally hit the moving joystick of the electric wheelchair. The chair rolled off the edge of a special podium designed to allow wheelchair fans able to see over the crowd, tumbling over 3 feet to the floor, where the man’s crashing head hit the metal pin, impaling him through the eye. The man’s friend is undoubtedly distraught, but the guy in the wheelchair is out of intensive care. No word on whether or not he’ll keep the eye, but at least he survived his accidental stabbing. Officials say the podium provided at Queensland Sport and Athletic Centre had back and side rails, but no rail in the front to keep the wheelchair from rolling out, just a strip of tape and a little lip of wood.